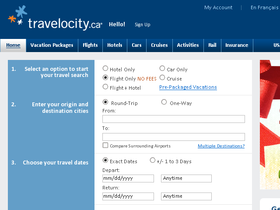 Travelocity.ca is the ultimate source for a great travel experience. Their line of services includes finding the best and guaranteed vacation packages, flights, hotels, cars and rails, cruises, last minute packages and helping you with your activities by destination. They also offer a low price guarantee to assure that you're getting a great deal for the travel you want. Save on your next purchase from Travelocity.ca with Travelocity.ca discounts, Travelocity.ca coupons and Travelocity.ca savings from 58coupons.com. Whether you're looking for a quick escape or a long-awaited vacation, Travelocity is offering savings on flight plus hotel vacation packages. Book your trip today and save up to $525. Save up to 70% off your last minute travel plans with Travelocity.ca! Just follow the link to start saving. Head on over to Travelocity to save up to 70% on weekend packages. Click link for details. Head on over to Travelocity to view the top secret hotel destinations for up to 45% in savings. Click link. Book with Travelocity.ca today and save up to 45% on 3 and 4 start hotels. Click link to get started. Act now and take advantage of Travelocity's Las Vegas Vacation deals.